Paropsisterna variicollis, the eucalyptus variegated beetle, was first detected in New Zealand in 2016. It threatens a growing eucalyptus forestry sector through larvae and adults causing significant defoliation to important plantation species. 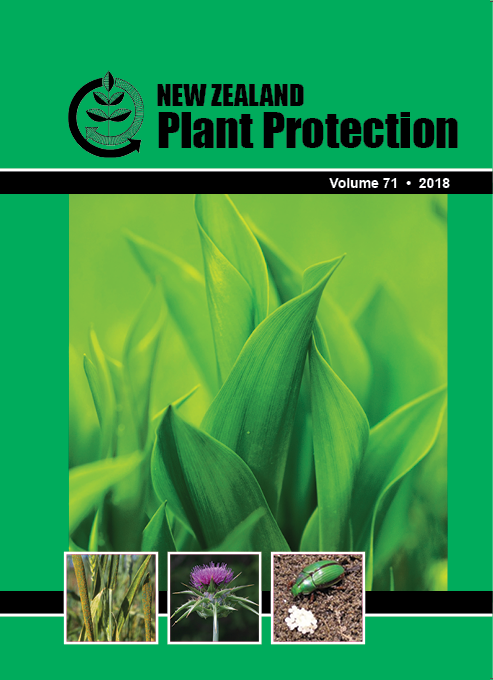 This work aimed to clarify the identification and origin of the New Zealand incursion to inform selection of suitable biological control agent(s). Australian and New Zealand specimens from the Paropsisterna obovata-variicollis-cloelia species complex were analysed by PCR and sequencing of two genetic loci, cytochrome c subunit I (COI) and cytochrome b (Cyt b). Molecular analysis of both genetic regions showed three major clusters of diversity. Cluster 1, proposed as Paropsisterna variicollis, had maximum 1.3% genetic variation and was collected from New Zealand, Western Australia and from geographically diverse locations in eastern Australia. Taxonomic results identified distinctive phenotypes of other closely related beetle species, assisting in proposing Cluster 2 as Paropsisterna near decolorata and Cluster 3 as Paropsisterna agricola. Molecular results were compared to morphological structures on adult beetles.